The 3rd-5th grade students in the after school program at Sand Hill Venable Elementary School served as master taste detectives last week as they used their taste buds in an activity featuring local microgreens from Rise Up Rooted Farm. 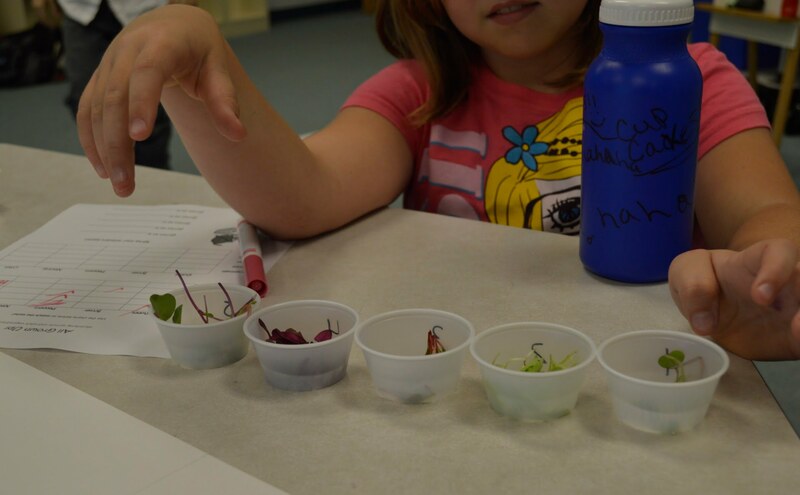 The activity was conducted by the spring Growing Minds interns and required students to test their knowledge of kale, chard, beets, cabbage, and radishes as they matched clues with each vegetable. They were then asked to taste unidentified microgreens (aka “baby” versions of each “adult” veggie) and use their detective skills to distinguish which microgreen matched which vegetable. The students used charts with different taste categories such as ‘bitter’ or ‘spicy’ to help match up the baby and adult vegetables. Some sprouts were easier to distinguish because of their color and taste, while others left many students—and the teachers—stumped! The beets were a big hit among many of the students, with their sweet taste and bright red color, but the spiciness of the radishes took a little more getting used to for some. Overall, the students enjoyed getting to use deductive reasoning to taste new versions of familiar foods as well as vegetables they’d never heard of before. Next post: Building a kinder-"garden"